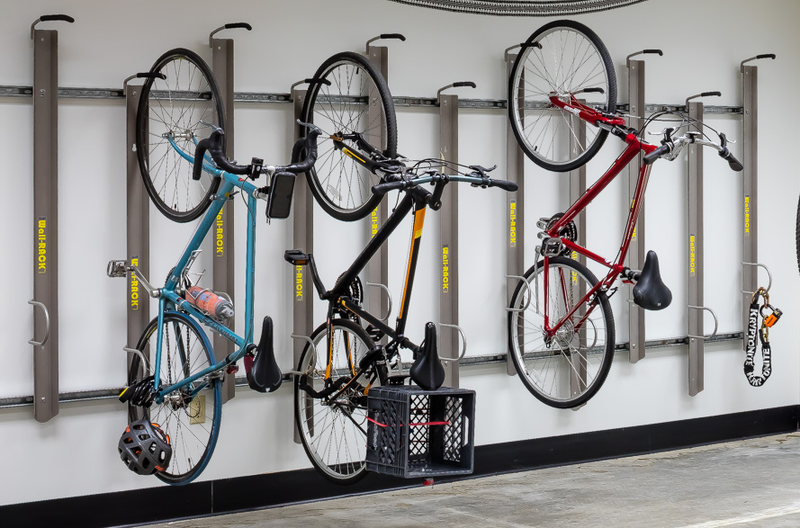 When creating a space that is meant to secure bikes for more than two hours - often referred to as long-term bike storage - a significant challenge will be to maximize the number of bikes that can be parked in the available area. Minimum space between parking "stalls"
Vertical bike storage is accomplished through mounting bike racks that have been designed and are intended to hold the bike vertically to a wall or freestanding support. By storing the bike vertically, what once was the typical bicycle footprint of 72" on the ground, turns into a 48" footprint when hung vertically. This additional 24" can then be allocated to create an aisle measuring a recommended 48" wide or a minimum of 24". It is recommended, in total, there be a distance of 96" from the wall to the farthest side of the aisle. 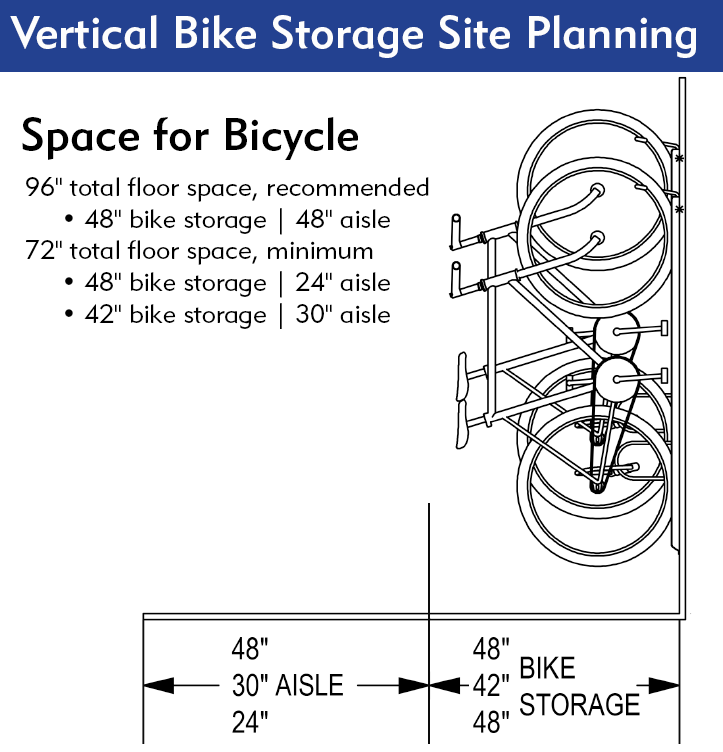 At a minimum, there should be 72" dedicated for vertical storage of bikes and the aisle. 48" for the bike and 24" for the aisle. It is necessary to create aisles of appropriate width (48" recommended | 24" minimum) in your bike storage area that allows for loading/unloading the bike on the rack and travel in/out of the space. Minimize Space Between Parking "Stalls"
The height of vertical bike racks can also be staggered vertically. By raising the height of every other rack, bike parking spaces can be placed closer together. The typical handlebar width is 24" and racks set at the same height would need this spacing to avoid handlebar conflicts. This spacing also does not account for wider handlebars, baskets and other items that would increase the width of a bicycle and cause overlap. Vertical bike storage allows for the heights to be staggered and the spacing between vertical bike racks to get down to between 14" and 16". The staggered height between each rack will vary depending on the rack system you use, but it's likely to be between 8" and 12". 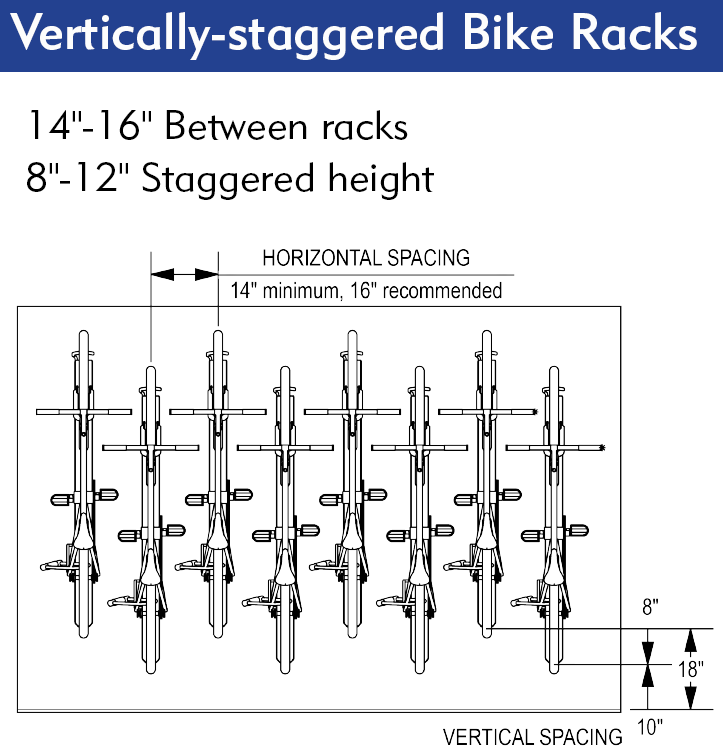 Ultimately, the shortened spacing because of the staggered height lets you park a greater number of bikes than you could by having racks at the same height on the wall or standard racks on the ground. The necessary ground clearance will be dictated by the specific rack used. Though it is typically 8"-10". The specific bike rack will also determine the lifting clearance which is measured by the depth of the hook that supports the bicycle. The typical length of a bicycle (72") is then added to these two numbers to find your total height requirements. The rack will ultimately need to be installed at a height that allows the bike to be lifted above the rack without hitting the ceiling, lowered into the rack element and then suspended a few inches off of the ground. 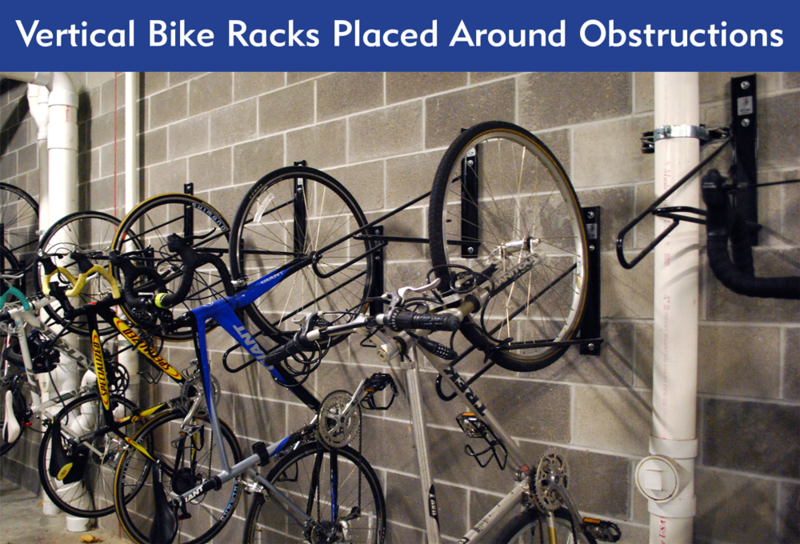 When planning to install vertical bike racks along a wall, certain systems require a horizontal strut to be mounted to the wall that the racks are then mounted to. These will require an unobstructed run of a wall to use. Otherwise, individual vertical bike racks will need to be used. This allows you more control on the placement to work around these objects. Vertical bike storage works best on concrete surfaces. As you will most likely be installing the rack into existing concrete, you will need to know the limits as to how deep the concrete can be drilled. This is because many racks require it to be fastened using an anchor bolt. If the installation surface of your bike storage area is made up of concrete block, brick, steel or metal studs behind drywall, all of these will require specific mounting hardware. It is important to verify the vertical bike rack you plan on using offers the mounting hardware for your surface. Because vertical bike storage requires the cyclist to lift the weight of their bike to store it, it is not ideal for users who may have difficulty lifting bikes. Ground-mounted bike racks with vertical staggering may be preferable for these situations. The outcome for your bike storage space should be to provide a reasonable expectation of securing a bicycle for longer periods of time with limited supervision. To accomplish this, a vertical bike rack needs to have an element that allows the frame of the bike and at least one wheel to be secured to the rack using a U-lock. This lockable element of the rack also needs to be constructed of materials that resist cutting, bending or deformation. These are features of the rack that will offer the most security and make it difficult for potential thieves to break the rack with common tools that could be carried in a backpack. Look for these elements when evaluating vertical bike rack options. Direct wall mount vertical bike racks provide the greatest amount of flexibility in their placement as they can be spaced and staggered as needed. 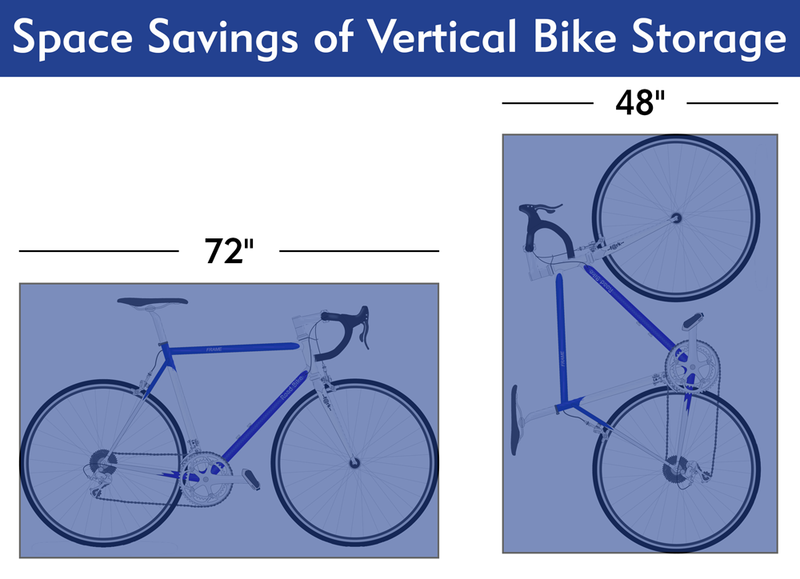 They are usually the most cost-effective type of vertical bike storage as well. Each rack only requires a few inches of wall space, making them ideal for working around mechanicals and other obstructions. Each rack would require putting multiple holes in a wall. A strut wall mount vertical bike rack includes a horizontal "track" mounted to a wall, with vertical bike racks attached to the track. The main benefit of strut wall mount bike racks is the ability to re-position bike racks without the need to drill new holes for mounting. It also requires fewer holes to be drilled than direct wall mount racks. To utilize these racks, a length of unobstructed wall is necessary to place the tracks. Vertical bike racks can also be configured to be freestanding. The rack elements are attached to a supporting frame that stands on the ground. These are great solutions when mounting to walls is not a feasible option. 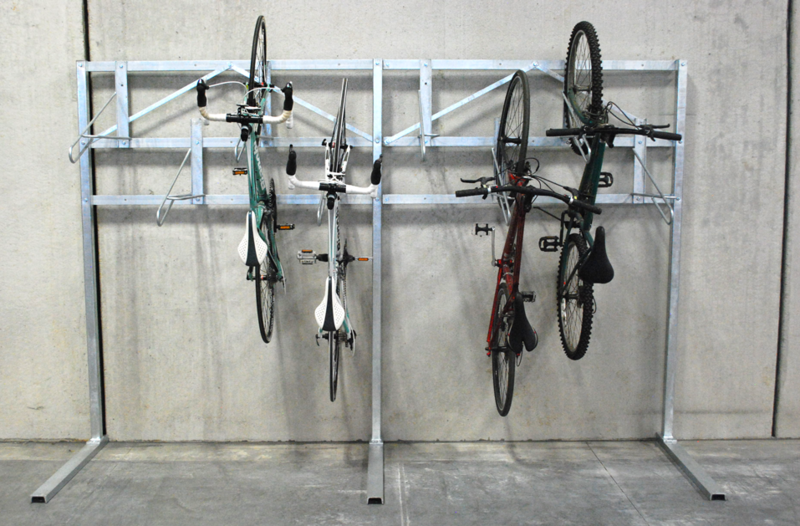 They're also ideal for implementing vertical bike storage in open areas. This style tends to be more expensive than other vertical bike storage options. Vertical bike storage is an effective solution for creating a useful space that maximizes the number of bikes that can be parked. But when having to factor in the shape and available space, ceiling heights, mounting surfaces, obstructions, and so on, it can quickly become a burdensome task keeping you from successful solution. Let the Madrax reps use their years of experience helping customers create vertical bike storage spaces to assist you to a quick, successful solution. Use our live chat found in the lower-right of your browser to immediately start interacting with one of our reps (available during regular business hours). Or you can contact us and expect a response in less than one business day.